I became a vegetarian at three years old. My mom made the mistake of telling me what I was eating when I was chowing down on my turkey sandwich and it was game over after that. I’d loved animals from a young age, so that’s where my vegetarianism started, but as I got older it became less and less about animals and more about health, social responsibility, and texture of meat (I’m picky). When you haven’t consumed meat in over twenty years, it becomes easier to remain a vegetarian. 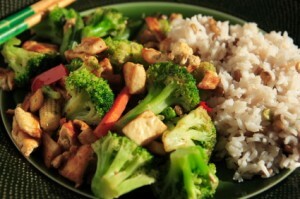 Converting to vegetarianism from meat eating, however, can be a challenge for most people. Oftentimes when people find out that I don’t eat meat, they share their stories of attempted vegetarianism which is ultimately failed after a period of time. The truth is, vegetarianism isn’t for everyone, but it’s proven to be better for our overall health, energy levels, and the environment. The consumption of animal products has been linked to various diseases, including a spike in the likelihood of different cancers, obesity, high cholesterol and blood pressure, heart disease and the likelihood of heart attack. The top meat providers in North America are ethically questionable at best. Meat is also a grocery budget buster, and can add a significant amount of money to our mortgage spending. Many families participate in programs like meatless Mondays, or at least make a conscious effort to serve less meat at meals for their health. But could your family ditch meat completely and turn into vegetarians? So many people enjoy meat because it’s filling and hearty. It’s a natural comfort food for some because of these properties. If you go from eating steak and ribs to eating salad, you won’t be successful. Sure, vegetables are great and a necessary part of anybody’s diet, but there are many foods out there besides vegetables. If you eat a well balanced vegetarian diet, you’ll never have a protein deficiency. You actually don’t need meat for protein, but you can eat less meat for the same amount of protein as you’d get in a lot more plant based foods simply because it’s more dense. Eat legumes, quinoa, and other protein rich foods to ensure you are getting enough protein. When your body needs a nutrient, it craves things, and craving meat is going to make you cave. People don’t generally make big life changes for no reason, so wanting to become a vegetarian typically has an underlying reason. Maybe you have some health concerns, or health issues run in your family. Perhaps you are sick of the financial drain that meat can become. Regardless, reminding yourself why you are becoming a vegetarian can be helpful. Periodically watch a documentary or read an article that supports your decision to cut out meat. Meat such as steak, wings, and ribs can be an indulgence for some people, so it’s important to replace that indulgence with something else when you turn to vegetarianism. If you don’t indulge, you will end up caving and it will be incredibly difficult to stick to your guns. Find another secret pleasure that you can indulge in, instead of depriving yourself. Vegetarianism isn’t for everybody, and in fact, many people have no interest in it. It’s perfectly fine to eat meat, but if you want to explore vegetarianism, try to use some of these methods to make your challenge more successful. We quit eating meat last year and it hasn’t been that big of a hassle. I don’t miss meat at all! Daisy! We are close. And I agree that meat is a wallet buster. We never have it on the grocery list, but may have it out on a sandwich or with hummus or the like. Steaks, or any prime cut of any meat, have just become so ridiculously priced, they are out of the question. Have a marvy day, Daisy!!! Great tips! We went from eating meat to being vegan. I was sure that I wouldn’t be able to do it and only committed to it for 30 days … I never looked back. I can honestly say that I’ve never missed meat. One of the things that helped me is NOT trying to recreate meat dishes with meat substitutes. They always proved to be disappointing. So, in my opinion, it’s better to come up with new and interesting dishes rather than try to make the ones you’re used to. Also, meat carries a lot of flavor so vegan food can be a bit bland if the flavors are “amped” up. We use a lot of spices and herbs to enhance the flavor. Thanks for a great post! I adopted a vegan diet about a year ago. Lost 20 lbs the first two months and then stabilized. I’ve discovered a new food world I knew little about–tons of great foods and recipes! I’ve learned a lot about nutrition, and I love the thought that each meal is helping, not hurting, me. I definitely think that I could become a vegetarian. It is something that I am working on! I have definitely tried to eat less meat, and discover/incorporate more non-meat meals into my diet. That said, I don’t plan to go totally vegetarian or vegan anytime soon. Nevertheless, I’m intrigued by what I read about health benefits of a vegetarian diet. I think I could do it if I wanted to. After drinking soda fairly regularly, I haven’t had one sip of it over the last 7 months. So I’ve been able to make big changes in the recent past. Mind over matter! Recently, though, I’ve felt I’m not getting enough nutrition on the weight loss/lower-the-blood pressure diet. I find myself craving meat and also heavier, starchier types of vegetarian meals — I’d eat the whole giant container of lentils that’s in the fridge if I didn’t think I’d blow up like a balloon. Matter of fact, I bought a steak at Sprouts yesterday and intend to have half of it for breakfast this morning. Funny, we have a Sprouts very close to our home opening up within days. What are your thoughts about the store. Looks good, but we are getting pretty good deals at HEB. I haven’t become a vegetarian, I think it would be tough for me but I definitely cut down on meat…after watching a documentary on Netflix called Forks over Knives. I think cutting down on meat is a lot healthier. I don’t think I could go 100%, but we have at least 1-2 vegetarian meals a week. In the summer, I really love to have salads. In southern California, some may feel summer lasts all year. In truth, it is about 6-8 month out of the year, I eat a lot of salads. It’s good to change diet, but we need to make sure to find an alternative source of the essential nutrients that we can get from meat. I was pretty good at going vegetarian a couple years ago but then I moved into a tiny apartment with only a partial kitchen – that kind of killed it then and there. I’d like to go back to it though – I felt great! Thanks for the tips! Sure I could do it no problem. We don’t eat lots of meat as it is, mainly sausages and turkey or chicken mince. We eat tonnes of vegetables, beans of all kinds, and eggs and nuts. When I lived on my own I didn’t eat much at all anyways. Now going vegan, I’m not sure about that one. I have been vegetarian for four years, but I still cook meat for my family. Every once and a while I crave meat. I try what I am cooking for my family, and the first bite is usually good. By the second bite it tastes bad, and within the hour I have a stomachache. Once you have done it for a while, your body makes it hard to go back. It was easy for me, because I’ve always been one and meat doesn’t seem too appealing to me, but I know what you mean!